The Spa Sensations Steel Smart Base Bed Frame is a steel bed foundation that eliminates the need for a box spring. It requires no tools for assembly and can be put together in minutes. This slumber 1 bed frame with maximum weight capacity will provide ultimate support for twin, queen, twin XL, king, California king or full size mattresses. Flat, rigid mattress surface of this 14 inch foundation bed frame gives you large room for under bed storage also offers the utmost comfort for perfect good night sleep. Moreover, its 12 contact points between the mattress and floor offer that rock solid support and stability. This sturdy king bed frame is equipped with caps on legs that helps to keep your floor scar and mar-free. 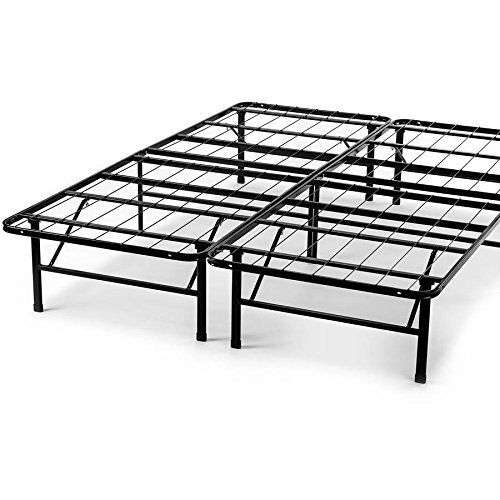 The Spa Sensations Smart Base bed frame has a midnight black finish that will complement any decor.